I’ve been busy trying to study for mid-terms, when right in the midst of it all, my girl came into season early. I’ve been wanting puppies from her line: Winning show dogs with amazing personalities. Also, they are very smart, which though challenging, makes for great field and obedience dogs. I would really like to start one of the coming puppies in agility as well. This will only be my third litter in some 16 years of owning and showing pure-bred dogs. Several months ago I announced the planning litter, and a few good homes came forward to express interest in a puppy. If my girl has about six puppies, I’m good for homes, but if she does like her mom did and there are 11 (or more), then, I will do what I need to in order to make sure they go to loving homes. I try very hard to spend equal time with all the dogs, but since my one girl has to be kept separate for this time, it’s hard to not spend just a little more time with her. I don’t want her to feel as if she’s getting punished just for being a girl. I have a TV in her room and we’ll sit on the bed together. She’s constantly trying to snuggle just a little closer. The other girl and the two boys all race to get on my lap first when I leave the girls room and sit on the couch. I usually end up in the middle of the couch with a brother on either side and my older girl standing in front of me licking my face. This situation makes studying for school complicated, at best, and impossible most of the time. I’m really looking forward to the new additions to the family. I’ll be busier, but having just as much, if not more fun. I grew up in Washougal. Our family used to have cows, and so we always had the usual farm animals; cows, chickens, cats, dogs. When I was 11, some one dumped a young, silver point German shepherd near our farm. Unlike almost all dumped dogs, this one was lucky and we took him in. He turned out to be a pretty good farm dog. We called him Charley. My sister decided to enter Charley in 4-H obedience classes, and her little sister (me) always tagged along. One day, while my sister was working with Charley, I went back to the car. Someone had come to visit the obedience instructor, and in the back of the visitors’ car were two amazing, tall, thin, long haired elegant, majestic looking dogs. I was instantly smitten. I did see the person who owned the dogs, and I never learned who it was; but, I promised myself that some day I would have a dog like that. 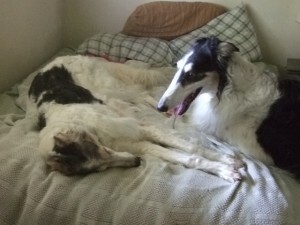 It took me 10 years to learn I’d fallen in love with a Borzoi aka Russian wolfhound. It was another 10 years for my first Borzoi to enter my life. Just how he came to live with me is another wonderful story. He was my love, he was an amazing teacher. He taught me a lot about dogs and life. I’m so glad he was part of my life. Since a lot of people don’t know much about Borzoi, I took it upon myself to learn as much as I could about the breed as I could. It’s only been 15 years now, so I’m still learning, and love to talk dog with anyone willing to listen.